comicID is an identification service for the digital comics formed with the images generated by scanner. comicID provides a copyright protection service on the digital comic books, which could be distributed through internet illegally such as portal site, webhard or torrent. With its excellent performance which is over 98% identification rate and fast recognition time, it is very useful for the copyright owners to protect their copyright of the scanned comics by effectively blocking the illegal distributions. The identification algorithm is strong enough to handle the transformed or various editing-typed images. It provides a book-based identification service by analyzing the extracted fingerprint from the scanned comics, and comparing with the prebuilt DB. The identified scanned books as the copyrighted contents can be blocked not to be illegally spread further. It provides registration and management service on the copyright information (title, writer, publisher, publishing year and ISBN etc.) to protect the copyright of the comic books. 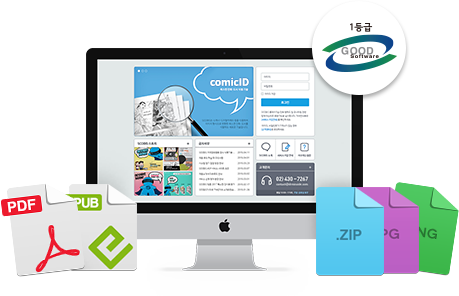 Blocking the illegally shared comics and preventing copyright infringement by taking the comicID service on the illegally distributed contents through the portal sites such as blog, café and mini-homepage, or the P2P sites such as webhard or torrent. Enhancement of the detection performance in correctness and reliability by adopting the comicID into existing monitoring service which is to research the statistics on illegal distribution of the scanned comics and gathering the evidences of the infringement.